Nonna Lina was born over 75 years ago in the small town of Frosinone, which is located just 86 km. outside of Rome in Italy. 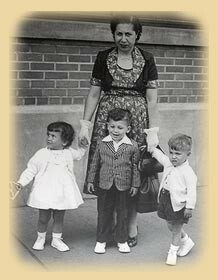 Nonna immigrated to Canada when she was 27 years old with her brother and Mother to join her Father who had arrived in Canada earlier. 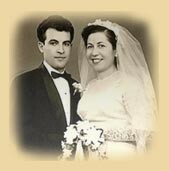 Nonna went on to marry a Calabrian man who lived on her street, and together they raised 5 children, all who have now married. At this time, Nonna and her husband today are the proud grandparents of eleven children, and great-grandparents of one, with another soon to arrive. Most of Nonna's grandchildren have been fortunate to live close to their beloved Nonna, stopping in at her house every day. Like most Italian Nonna's, Lina always cooks extra each meal, wanting to have something on hand when the hungry little ones stop by. Italian women all seem to share a passion for food, and perhaps this is why life in an Italian home always seems to revolve around the kitchen. The kitchen is the heart of the home, where family members exchange news, guests are entertained, and where the women of the home spend a good deal of time each day planning and preparing meals for their families. "La cucina della Nonna refers to both the tradition of a grandmother passing down her own personal recipes to the next generation, as well as the fireplace, or hearth over which these beloved family members have prepared endless meals for their loved ones. Lina is a perfect example of this tradition as she shares the recipes she learned growing up with her own children and grandchildren. Although today few women actually cook over an open fire, today's Italian grandmother's still follow the tradition of "Nonna's kitchen". Some may use more modern equipment than their own Mothers did, but often the recipes they prepare each day are ones their own mothers and grandmothers made. It is the rare grandmother who actually cooks from a written recipe, and Nonna Lina is no exception. When asked how one prepares a specific dish, Nonna's instructions are as vague as to scoop up un pugno (a handful), and to pour al dito. She measures her ingredients all'occio, and judges if her mixture is perfect simply by feel. In order for Nonna Lina's daughters and daughter-in-laws to learn how to make their favorite dishes, they must follow her around her kitchen, furiously scribbling out the instructions, and often scooping up ingredients from the counter into measuring cups to learn exact amounts used for each recipe. Nonna Lina first began to learn to cook as a young child at her grandmother's table. Lina would help her make the fresh pasta each Sunday, trying hard to please her Nonna by rolling the pasta out by hand as thin as her Nonna did. When she would give up in frustration as her little hands just were not up for the task, her Nonna would tell her not to worry, and that with practice her pasta too would one day be perfect. Anyone who has tasted Nonna Lina's fresh pasta she makes for her family each week by hand would know that indeed she has perfected the art of making pasta. While thinking about the foods Nonna Lina prepared throughout the years, I realized they are based on simple ingredients, as in the tradition of la vera cucina Italiana. Many of the ingredients she uses are harvested the same day from her plentiful garden. However, it is not just the ingredients she uses, but the preparation that makes them magic. Not only are a "pinch" of this, and a "handful" of that added to each recipe, but also a lifelong heritage, and of course abundant love. I sometimes feel that Nonna Lina simply prepares her meals to fill her family and friends with love. The tantalizing aromas that filled my Nonna's house are an important part of my growing up, and a place to where my mind wanders when I need comfort and peace. It is not surprising after growing up in a family that places so much importance on food, that I was compelled to study food for 6 years, and now I find I am still delving deeper and deeper into my own passion for cooking following in the footsteps of extraordinary mentors such as Nonna Lina. My Nonna will always be an inspiration to me, and I look forward to the day when I can carry on the tradition of teaching my own children some of Nonna's special recipes." 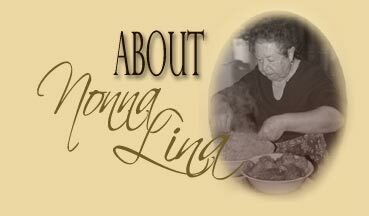 This site was created to share some of Nonna Lina's wonderful recipes, as a dedication to her for the countless wonderful meals she has made for years, and still continues to prepare for family and friends each day.